The Greeting Farm: Body Snatchers Challenge! Hope you’re all having a wonderful weekend! I had a crafty day at my monthly craft group meeting…I got 3 single-page scrapbook layouts and one double-page layout done! I haven’t scrapbooked in so long…it was fun to switch gears for a bit and get some pages done! This card is for the Body Snatchers Challenge over at The Greeting Farm! 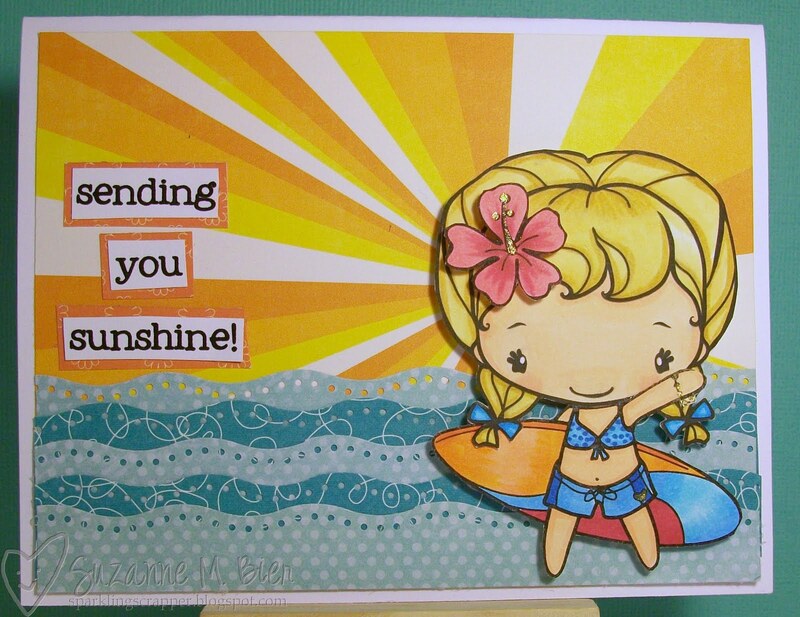 I used Country Anya‘s head combined with Surfer Anya‘s body (and the flower that’s usually in her hair) for this sunshine-y, summery card! Supplies: paper (Echo Park Splash, Sassafras Nerdy Bird, Echo Park Walk in the Park), typed sentiment, Copic markers, gold gel pen, EK Success wave border punch, foam squares. Thanks for stopping by! This contest runs until noon CST on Thursday, June 16! Check out The Greeting Farm’s Farm Fresh Challenge Blog for all the details! You did a fantastic job on this body snatchers card! so fun!